When our reserves are down it can be the little things that kids do that can push us over the edge! Whinging, hyperactivity, ignoring your requests but wanting your attention when it suits them… all add to our stress load and push us to snapping point. This week we look at ways to keep cool when they’re in your face, and stay in control when it comes to addictive behaviours with technology. The more time kids spend being entertained by screens, the less creative they are in finding others forms of entertainment. As a person who recognises my own addiction to technology, I can completely understand my children’s desire to play games, watch video clips and interact with other people. The ‘evil’ used to be the TV, but now there are so many other ways for children to engage in screen time. I completely believe that every household has their own rules and expectations, but it’s confronting for me to see suggested guidelines for screen time (one guide is by the Raising Children Network http://raisingchildren.net.au/articles/screen_time.html – suggestion only) and recognise that my family pushes the boundaries in this area. What are you modelling to your children? If we have our phone in our hand 24/7 then our children are learning that we rely on technology. And if I’m going to be honest – I do! However, be explicit with your children regarding the usage of your device. Banking, emailing, working, contacting friends, school, relatives… are all important uses for our device. Make it clear that you are not just having fun, but that your device is a TOOL to enable you to do the jobs that need doing. Does it bother you that your child spends too much time on a device? If it’s a problem for you, then IT’S A PROBLEM. Every child will respond to screen time differently. There’s a difference between spending 20 minutes on Reading Eggs as opposed to 2 hours on a shooting game. Use your discretion as a parent. It’s probably not realistic to cut technology out altogether, but it’s up to you to work out what is appropriate for your children. What impacts are excessive technology use having on your family? If you are being ignored and responsibilities are not being taken care of, it might be time to address it. If it’s resulting in a reduced ability for your child to amuse him/herself in other ways, it might be time to address it. 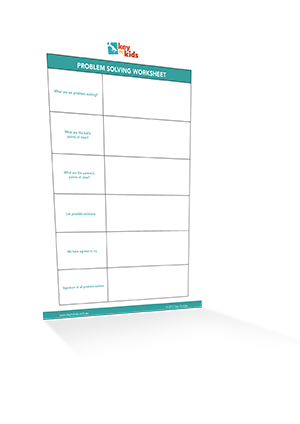 As previously mentioned, the best way to handle an ongoing issue is to problem solve. There is an example of problem solving technology use in the resource section this week. Listen to your child’s point of view – why they like technology and how they see it’s benefits. State your point of view – here is where you list the SECONDARY problems such as ignoring instructions, not completing expected tasks, not being able to entertain themselves in other ways. List ways to use technology in a healthy way for your family. Decide on some mutually agreeable goals and both commit to trying them. Ideas for compromise include using a timer, only allowing devices at certain times of the day, only allowing devices after jobs are done, making devices shared and open, committing to other activities such a sport, board games, lego etc, games only played when educational aps are done first, week day times and weekend times compromised. For some children, technology can induce hyperactivity. For some children hyperactivity comes naturally – without any prompts! If you are drowning in noise and activity and are desiring some peace and quiet, here are some ideas to think about. Do you model peaceful interaction with your partner or to others? Our children are always watching and learning from the way we interact. Just like when children are having a meltdown they can’t hear us – if they are completely giddy and crazy, they won’t hear us either. Don’t waste your breathe and energy trying to get your child to calm down when they are as high as a kite. More effectively, use physical proximity to get down to your child’s level and ensure they are looking at your eyes. Only if they are connecting with you, speak to them calmly and quietly with your expectations. Eg. ‘It’s time to get in the bath.’ Remember the hyperactivity is a secondary behaviour – think about what is more important – your intention (them having a bath) or addressing the behaviour (them being silly). Often children say I’m bored because they are expecting you to engage with them or create some entertainment for them. As mentioned earlier, technology can be the enemy of boredom. I myself recognise that I struggle to sit still and do nothing while my phone is in reach – I have learned that every second of my time can be filled with something to entertain me! This also applies to children. Parents are very good at deciphering what is a whinge and what needs appropriate attention. Obviously if a child is hurt or emotionally disturbed we need to give them our proper focus, though when it’s not worthy of an hour whine we can nip it in the bud. Firstly, if a child is upset we still need to acknowledge their feelings. This can be as simple as saying ‘I can see you’re upset, you wish we were still at the party’ but if they will not accept your efforts then distraction is the best key, particularly with younger children. The crazier and fun you can make it, the better! Look for inspiration around you and say ‘Look! A dog! I wonder what his name is?’ Be silly, be fun and above all be distracting!! If you don’t have the energy for a game of imagination, you can simply state the problem and your expectation. “I have listened to your story and have helped you as much as I can. Now it’s time to….” and don’t engage in the response. Say it like an expectation and move on. It’s not easy to listen to the whinging, but when they realise they are not being rewarded with your attention, it will soon stop. We touched on ignoring due to technology, but what happens when they are ignoring you just ‘just because’. We can all identify with a case of the ‘selective hearing’ so if you know your words have been heard but they have just chosen not to act on them, here are some ideas. Don’t keep repeating instructions, it will only make you more and more annoyed.